If any of you read my posts on Monday, I had told you I love watching videos that open up my mind, inspire me and push me to be more creative. Well, I have become inspired and wanted to show you all what I have come up with. I want to show you a circuit in which the numbers do not matter or the path to get the job done. I go from sprint on the treadmill to over or under the box however I choose to squat, clean press with the kettlebells to some bear crawls to explosive push ups to the ropes to pull ups to jumps over the benches. Continuous movement. No stopping, no interruptions. Just transitioning from one exercise to the next without very little rest in between. No where in this circuit was I worried about reps, sets or time. I would simply perform an exercise as best as I could for as long as I wanted to. My primary focus was full body movements and enjoying the exercises. And boy did I enjoy this circuit. A couple of weeks ago I was able to take advantage of an internet sale and purchase a new pair of Vibram’s I had my eye on for a discounted price. The new pair of vibram’s I purchased are called the Seeya’s. The Seeya’s are their new extremely minimal very light weight running shoe. Let me tell you I fell in love with them when I first put them on. They are very comfortable, very light weight and very minimal. My first time putting them on they slipped right on with no hassle at all. Many of you vibram fans out there should be very familiar with wrestling a brand new pair of vibram’s on your feet. Feeling like it takes about 3 minutes per foot to get them on. Not with these, these slipped right on with no wrestling. There was hardly any break in period and felt great instantly. I could not wait to test them out and they certainly did not disappoint. I am not a runner at all by any means. I prefer to do sprint training. High intensity sprints usually on the treadmill lasting anywhere from 10 to 30 seconds. They performed very well and I had no issues with them. They are like I said very light, so at first they seemed like they would just fly off my feet. After tightening the strap, I started getting really comfortable and trusting with them. They feel great and I look forward to trying them out in the grass. They perform very well in the gym too. I have no issues with jumping, lifting and moving around in them. 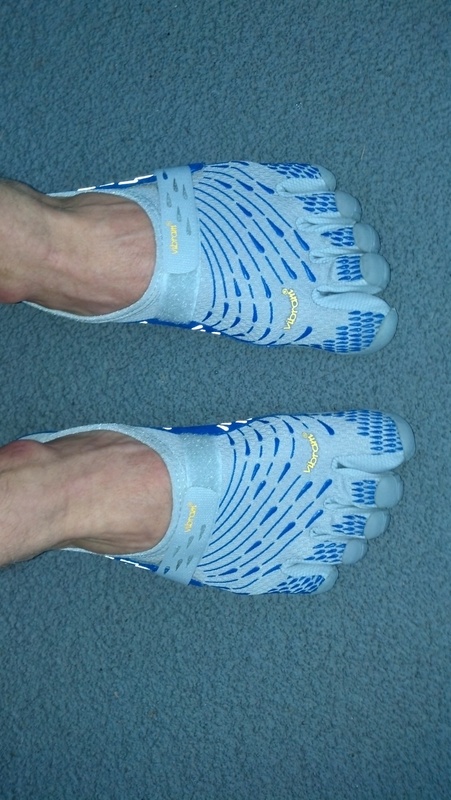 They are definitely a welcomed pair to my vibram family. Here is a video of me showing you how to do sprints on the treadmill. You want to get shredded, melt the fat, and jack up your metabolic rate? Then add a sprint routine into your program twice a week. I would recommend warming up first by walking for 5 minutes then hop off to the side and increase the speed of the treadmill. Ladies you probably want to start at 8 mph and increase to 10 mph. Guys you can start at 10 mph and increase to 12. When you are ready, hop on and run for 15 to 20 seconds and hop off to the side. If you fun for 20 seconds, rest for 40 so that way you are going every minute on the minute. Start slow and only do 5 sprints your first time out. Always have the treadmill on 3% incline or greater. This helps make up for the mechanical advantage of the treadmill. Obviously, if you want to make this more challenging you can: 1) Increase the speed 2) Increase the incline or 3) Decrease the rest time. In the video you can hear a faint beep and that is my GYM BOSS timer set for tabata intervals. Tabata training is designed for 20 seconds of work followed by 10 second recovery. Tabata training is a great way to add some much needed intensity to your workout and can be used for any exercise. Good luck to you and happy sprinting.